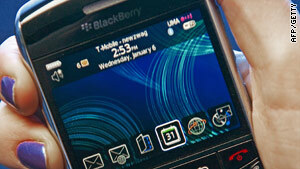 The BlackBerry may not be especially hip, but the device remains the most widely used smartphone in the U.S. 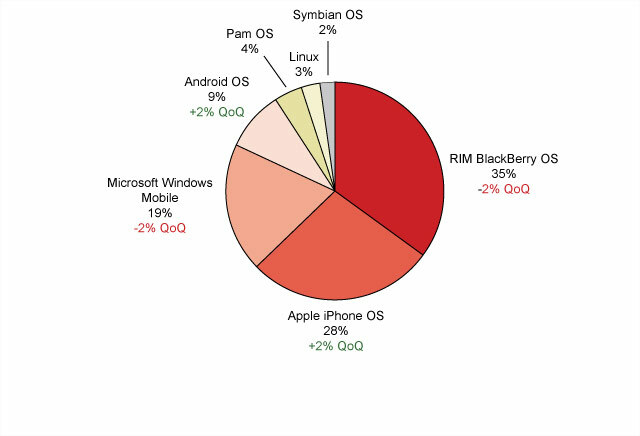 The BlackBerry is the most popular smartphone brand in the U.S.
(CNN) -- It's the smartphone everyone owns -- and no one seems to like. Peek into any executive conference room in America, and you're bound to see one -- or a dozen -- of these anachronistic smartphones: BlackBerrys, their keys clicking like rain on a tin roof. Those red lights flashing, training their owners to pick them up on a second's notice: An e-mail! A BBM! Answer me! To owners of Android-based phones and the iPhone, particularly in the U.S., the BlackBerry is starting to look more than a little too old-school. These phones don't really run apps. They don't store much music. Their screens, in general, are much smaller than those of smartphone competitors, meaning it's difficult or impossible to browse the Web comfortably or watch online video. A new BlackBerry phone -- the Torch -- was unveiled on Tuesday by maker Research In Motion. Even hard-core BlackBerry users don't seem that enthralled by it. Meanwhile, a survey released by the Nielsen Co. on Monday found the majority of U.S. BlackBerry owners -- 58 percent -- want to buy another kind of phone, usually an Android or iPhone, when they upgrade. But here's the kicker: Despite the fact that the BlackBerry isn't hip, high-tech or cheaper than its main competitors, the phones are still the most popular (or at least the most common) in the U.S. market, and they're growing internationally. So why do so many people still tolerate these phones? It turns out, according to a handful of interviews with BlackBerry users, there are three basic reasons: People are addicted to the click-clacking keyboard; they love the blinking red light on the top, which alerts users to new messages; and many just happen to have the phone because it's required for work. Ask a BlackBerry user what they like about their phone, and they're bound to mention the keyboard. Ask them why that keyboard is so great, and they'll go into sensual detail about the click of the keys, how the buttons are raised just so and how the "shift" key -- oh, the shift key! -- is just as easy to use as those on a full-size computer keyboard. "The keyboard is definitely a hook for RIM, and it's interesting to see that the marketplace, in general, has conceded it to RIM," said Kevin Michaluk, founder of the BlackBerry fan website Crackberry.com. "Everyone sees the iPhone, and they think apps. And I think everyone sees a phone with a keyboard, and they think BlackBerry, whether it is or isn't." This comes at a time when most smartphones -- including the iPhone -- are moving toward touch-screen-only interfaces, where users tap on glass to type instead of pecking away at tactile keys. The details of how the BlackBerry keyboard feels are what make it addictive, said Nan Palmero, a writer for another fan site, BlackBerryCool.com. "They really go to great lengths to raise plastic in certain ways on the keys," he said of the tactile keyboard's design. "They kind of describe it as guitar frets: Your hand naturally knows where to go and where to be." Palmero said he can type up to 40 words per minute on his phone. Michaluk said he can hit 65. Neither has to look at the keyboard. Kevin Kovanich, a 23-year-old BlackBerry user in Chicago, Illinois, who responded to a CNN Tech question about the phones on Twitter, said he loves that he can still "rock the keyboard" even though his thumbs are "larger than average." "It is really nice how far the buttons stick up -- and you can really feel that click," he said. "It doesn't feel like you're making any mistakes ... no matter how big your fingers are." On top of every BlackBerry, there's a little sliver of a red light, and it blinks at you when a new message or call comes in. People get seriously addicted to that light, Michaluk said. "You put a blinking red light on a device, and when that light blinks, you jump," he said. "It's Pavlovian training, right? For me, really, it's my connection to my people. And second, it's my connection to the world in terms of news and everything." He added: "It's one of those things that always calls you back to your BlackBerry." Of course, other phones have ways of alerting people to new messages, too, but none has the same feel as that BlackBerry light, users said. The BlackBerry is the get-things-done phone. It's not designed to run flashy applications, for playing games or for uploading pictures to Facebook and Twitter. It started out a business-minded device, and RIM has continued to market it as a business-friendly device, although recent ads have pitched it as a leisure phone for young multitaskers as well. Part of the allure is that the BlackBerry is known for being secure. It encrypts messages, which makes business owners more comfortable giving the phones to their employees, who may share sensitive documents and e-mails over the phones. This issue came into focus this week as the United Arab Emirates and Saudi Arabia threatened to stop BlackBerry service for this very reason: because they wanted to get inside private messages on the phones and couldn't. Other smartphone operating systems,including iOS 4 from Apple, are trying to cater more to privacy-minded business clients, but overall they've been more focused on the consumer experience. That image can work in BlackBerry's favor, writes Callie Schweitzer on a blog called Neon Tommy. She says the phone has a "mullet effect" in that it's "business in the front, party in the back." "See someone typing away furiously on a Blackberry? They're probably sending a top-secret e-mail," she writes. "See someone intently focused on an iPhone? They're probably playing with the Bubblewrap or Lightsaber Unleashed apps. Regardless of what a Blackberry user is really doing, the phone itself just seems so much more straight-laced and serious than the iPhone." Businesspeople also say BlackBerrys are just good for productivity. Partly it's the keyboard. Partly is a range of shortcuts. But this no-frills phone has hooked many people in the bushiness world. That includes Michaluk, who said he was given his first BlackBerry phone -- he called it "old blue" -- from an employer several years ago. "That thing was just a tank; it was ugly; it had that low-res, almost monochrome display. And that thing -- I just loved [it]," he said.